Hozelock Cyprio was the originator of the three part system for guaranteed clearwater. This system extends an entirely natural way without chemicals. A simple trio of products, accurately sized for every pond up to 27,000 litres (6000 gallons), form the basis of our Clearwater philosophy. Either a Prima or Titan, depending on pond size. The top selling Prima solids handling pumps move polluting solids out of the pond into the filter where they can easily be removed. Unparalleled in their ability to circulate water in larger ponds, the enhanced reliability of the Prima range makes this an ideal pump for serious fishkeepers. Exceptionally effective Hozelock Cyprio Ultra Violet Clarifiers cause algae to clump together into groups too large to float. They then pass through the system to be removed by the biological filter foams. A range of Hozelock Cyprio Biological Filters for all applications serve two main purposes. 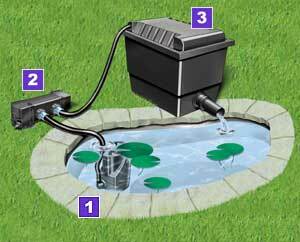 Firstly they act as a mechanical strainer for debris and clumps of algae, removing these from the pond. Secondly they create a home for millions of beneficial bacteria which digest pollutants as the water passes over them. These bacteria occur naturally on surfaces in the pond. The biological filter contains media of very high surface area to create a habitat for very high concentrations of bacteria. For more information please visit our "What is the secret of a clear and healthy pond" section.